HomeCultural LifeThe Heong GalleryPast ExhibitionsDO I HAVE TO DRAW YOU A PICTURE? The eighth exhibition at the Heong Gallery engages with themes of communication, breakdown of communication, and isolation. It brings together a collection of contemporary American and British prints, from the British Museum, and works in various media from private lenders, including prints, postcards, books, diagrammatic drawing, sign painting, tape recording, neon, LED, enamel plaques, bunting, and campaign posters. The rise of mass and electronic media meant that artists were no longer required for the transmission of objective content. Artists in this exhibition make communication and its technologies the medium and subject of their work. For these artists, as for thinkers such as Ludwig Wittgenstein and Marshall McLuhan, communication is never straightforward. From Louise Bourgeois' parables of personal relationships He disappeared into complete silence (1947-2005) to Bob and Roberta Smith’s open Letter to Michael Gove (2011) and Wolfgang Tillmans' pro-EU posters (2015), the exhibition explores the potential and limitations of communication in making connections across distances - whether they be psychological, cultural or geographical - and art's own role in ensuring that 'no man is an island'. Dr Elisa Schaar (BA Harvard, DPhil Oxford) is an art historian specializing in modern and contemporary art, with a focus on the relation between art and its broader social and political contexts and particular interests in art since the 1960s. Her research has been supported by a Terra Foundation for American Art Postdoctoral Fellowship at The Courtauld and a Leverhulme Early Career Fellowship at the Ruskin School of Art at Oxford, where she is a Visiting Tutor in art history and theory. She is a contributor of reviews to Artforum magazine. 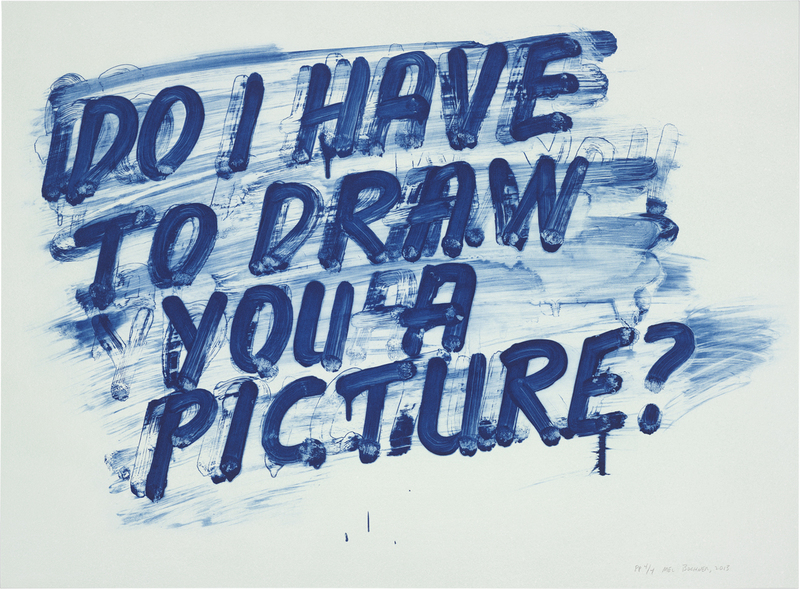 Cover Image: Mel Bochner, Do I Have to Draw You a Picture? 2013. © Mel Bochner, 2018.